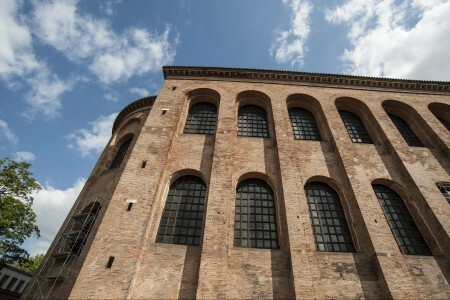 The so-called Basilika, Constantine's throne room, is the largest surviving single-room structure from Roman times. The Romans wanted the architecture to express the magnificence and might of the emperor. 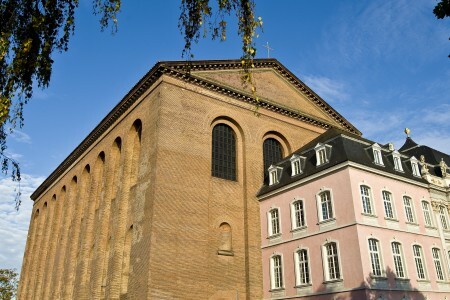 Since the middle of the 19th century, it has been used as the first and oldest Protestant church in Catholic Trier with a splendid organ answered by a seven-second echo. Please note: During the services and concerts it is not possible to visit the Basilika! 04/21/2019: 13:00 p.m. - 6:00 p.m.
04/22/2019: 13:00 p.m. - 6:00 p.m.
04/23/2019: 10:00 a.m. - 6:00 p.m.
04/27/2019: 10:00 a.m. - 6:00 p.m.
04/28/2019: 13:00 p.m. - 6:00 p.m.
05/01/2019: 13:00 p.m. - 6:00 p.m.
05/04/2019: 10:00 a.m. - 6:00 p.m.
05/05/2019: 13:00 p.m. - 6:00 p.m.
05/10/2019: 13:00 p.m. - 6:00 p.m.
05/11/2019: 10:00 a.m. - 6:00 p.m.
05/12/2019: 13:00 p.m. - 6:00 p.m.
05/18/2019: 10:00 a.m. - 6:00 p.m.
05/19/2019: 13:00 p.m. - 6:00 p.m.
05/20/2019: 13:00 p.m. - 6:00 p.m.
05/25/2019: 10:00 a.m. - 6:00 p.m.
05/26/2019: 13:00 p.m. - 6:00 p.m.
05/30/2019: 13:00 p.m. - 6:00 p.m.
06/01/2019: 10:00 a.m. - 6:00 p.m.
06/02/2019: 13:00 p.m. - 6:00 p.m.
06/08/2019: 10:00 a.m. - 6:00 p.m.
06/09/2019: 13:00 p.m. - 6:00 p.m.